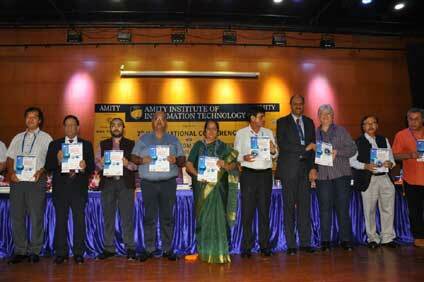 New Delhi: Amity Institute of Information Technology (AIIT) in association with Computer Society of India (CSI) and technically sponsored by The Institute of Electrical and Electronics Engineers (IEEE) started a three day 7th International Conference on Reliability, Infocom Technologies and Optimization (ICRITO’2018) at Amity University Uttar Pradesh, Sector-125, Noida Campus. Welcoming the gathering, Dr. (Prof.) Balvinder Shukla, Vice Chancellor, Amity University Uttar Pradesh said that Information Technology is developing at a rapid pace and has been a core functioning element for most of the organizations. Though, technology has made life easier for many but there are various challenges that needs to be addressed including data protection, cyber security etc. She averred that scientists across the globe are working towards developing an intruder detection and protection system to ensure complete cyber security. Inaugurating the conference, Prof. (Dr.) M. P. Poonia, Vice-Chairman, All India Council for Technical Education said that at present, there are 900 Universities, 43, 000 colleges and 10, 500 technical institutes in India providing sufficient infrastructure for higher education enrolments. “The aim of AICTE is to formulate holistic teaching pedagogy for students so that they are accepted as global professionals. The students should be nurtured as human resource of global level.” avers Dr. Poonia. He stressed upon the challenge that only 25 out of 100 students after class XIIth enroll for higher education in India. “Country will only develop when the more students will enroll for higher education.” he added. Dr. Poonia informed that the technical higher education infrastructure in India can enroll 3.7million students annually but unfortunately, 50% of infrastructure is unutilized due to low number of enrolments, i.e around 2 million. He pointed that out of the total enrolment, only 1.3 million students are able to graduate and even in that, only 700,000 students get placement. He emphasized upon reforms in Indian education system according to societal needs. The need of the hour is to bridge the gap between industry requirement of skill based global professionals and the existing technical education. He called upon the educational institutions to generate the interest of students in technical education and advised the teachers to monitor whether every student is able to learn about what is taught to them. Dr. Poonia highlighted few suggestions by AICTE including revision of curriculum in every three years, teacher training which should be mandatory for new teachers, induction program for students for atleast 21 days, creating entrepreneurial encouraging environment , exams should have outcome based assessment, perspective plan to be formulated after assessment of manpower needs and establishment of industry interaction cell. Addressing the gathering, Sh. Upmith Singh, Vice-President, Strategy, Policy and Program Management, Government e-Marketplace (GeM), Govt. of India said that Information technology has become an integral part of our lives and briefed about various e-governance programmes that has reformed the public sector. He remarked that with technological advancements, there has been a rising concern over data privacy and security. Mr. Singh called upon the gathering to deliberate and provide effective solutions to prevent breaching of data or personal information. The inauguration was followed by keynote addresses by international academicians on various topics including “Statistical Inference through Machine-Learning and Its Applications in Big Data” by Prof. Hoang Pham, Department of Industrial and Systems Engineering, Rutgers University, New Jersey, USA; “The Progression of Image Engineering in This Century” by Prof. Yu-Jin ZHANG, Director, Institute of Information Cognition and Intelligent Systems, Department of Electronic Engineering, Tsinghua University, Beijing, China and “Diagnosing Spine Pathology using Medical Image Analysis” by Prof. Vipin Chaudhary, SUNY Empire Innovation Professor, Department of Computer Science and Engineering, State University of New York (SUNY) at Buffalo (UB) amongst others. The three day conference has witnessed the attendance by eminent delegates and speakers from across the globe including USA, China, Germany, UK, Australia, Japan, South Africa, UAE, South Korea etc. and several Government organization such as DRDO, ISRO, BARC, NDA, CSIO, SL and NPTI. Also, more than 130 research papers will be presented by scholars from IITs, IITM Gwalior, IIM Lucknow, NITs, JNU, Jamia Millia Islamia, DTU and many others.